Nothing warms up a home for the holidays like Christmas afghan throws...and with this Sparkly Christmas Afghan, you can keep warm and cozy in the spirit of the holiday! Cuddle up by the fire and try this easy free afghan crochet pattern! 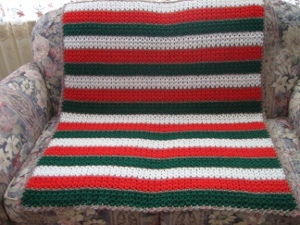 This afghan also makes a wonderful gift for a new home owner and is perfect for keeping your toes nice and warm on Christmas morning. This lovely afghan is simple and easy to make, great for crochet fans of all skill levels. You could even change the colors and make this afghan for any time of year. Row 2 – V St in each V St across and dc in last dc, ch 3 and turn. Row 3 – V St in each V St across and dc in last dc, fasten off and turn. Row 5 – With red sl st in first sc, ch 2, skip 1 sc, *V St in next sc, skip 2 sc, rep from * across, dc in last sc, ch 3 and turn. Rnd 1 – With multi starting at upper top right edge, (sc, ch 1, sc, ch 1, sc) in first dc, ch 2, skip 1 dc, *sc in next ch 1 sp, ch 2, rep from * across, ch 2, (sc, ch 1, sc, ch 1, sc) in last dc. Work along side edge, *ch 2, sc in next dc, rep from * across, ch 2, (sc, ch 1, sc, ch 1, sc) first ch st of bottom edge. Work along bottom edge, *ch 2, sc between 2 V Sts, rep from * across, ch 2, (sc, ch 1, sc, ch 1, sc) in last ch st.
Work along side edge, *ch 2, sc in next dc, rep from * across, join to beg sc, sl st into corner sc. Rnd 2 – Work along top edge ch 3, (1 dc, ch 2, sc) in corner sc, (sl st, ch 3, dc) in each ch 2 sp across ending (sc, ch 2, 2 dc) in corner sc. Work along side edge (sc, ch 2, sc) in each ch 2 sp ending (2 dc, ch 2, sc)) in corner sc. Work along bottom edge, (sl st, ch 3, dc) in each ch 2 sp across ending (sc, ch 2, 2 dc) corner sc. Work along side edge (sc, ch 2, sc) in each ch 2 sp, join to top of beg ch 3 and fasten off.